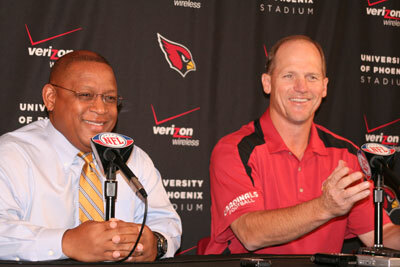 « Graves, Whisenhunt Press Conference at 4 p.m.
Cards Movin’ on Up for McClain or Williams? GM Rod Graves and Ken Whisenhunt didn’t announce anything ground breaking during Monday’s press conference, but they did reveal some information regarding their pre-draft preparation and some possible draft day moves. First, Graves is apparently somewhat optimistic that the Cards may move up in the first round by trading the teams’ extra third round pick, which the Cardinals acquired from Baltimore in exchange for Anquan Boldin. Presumably, the Cardinals would move up to fill one of the teams’ most pressing needs; either a nose tackle or linebacker. Alabama inside linebacker Rolando McClain (Crohn’s disease controversy and all) seems like a prime candidate as he is expected to go well before the Cardinals 26th pick. If the Cards, therefore, are willing to part with their extra third round pick and they can nail down which team is expected to draft McClain (many believe the Giants with the 15th pick), the team may make the move. There’s no doubt that McClain, the number one inside linebacker in the draft, would make a fine immediate addition to the Cardinals’ defense, which would then include Joey Porter, Gerald Hayes, McClain, and Clark Haggans as the 4 of the 3-4 defense. It’s possible, however, that the Cardinals may want to employ the same strategy to beef up the 3 of the 3-4 defense. Specifically, they may go after Tennessee nose tackle Dan Williams, who is expected to be drafted even higher than McClain; Williams is expected to be drafted somewhere between the 7th and 13th pick. Whisenhunt, however, is aware that drafting a nose tackle is a somewhat risky venture. “Just because you’re 6-foot-3, 330 pounds doesn’t mean you can play nose,” Whisenhunt said. He might as well have mentioned Williams by name; the former Volunteer is 6-2, 330 lbs. Whisenhunt also noted that since most college players don’t play a straight nose, it’s difficult to estimate what their impact will be in the NFL. Despite these concerns, it’s hard to imagine the Cards aren’t big on Williams. He’s only rated third in this year’s DT class because he follows wunderkinds Suh and McCoy respectively. Although Graves sees the upward move as a possibility, Darren Urban is not quite convinced it’s a real option and doubts it will actually happen. The Cards’ official website writer, however, believes another possibility is more likely; the Cardinals may move back into the second round. While no one likes the idea of moving backwards, it’s certainly not a terrible idea. Two very solid high second rounds picks could be much more valuable to the team than one late first round selection, especially if the Cards’ primary first round targets are gone. Whether the Cards move up or down or remain happy right where they are, Graves and Whinsenhunt gave some solid insight into their pre-draft preparations. Essentially, the team makes two draft boards. First, they comprise a board that rates players from lowest (1) to highest (100) based primarily on their potential in the NFL; this board has already been completed. The second board, the “Top 120,” ranks players according to the teams’ needs and how each players’ skills fits those needs. On draft day, therefore, the team attempts to pick the player with the greatest potential in the NFL whose skills most closely fit with the teams’ greatest needs. This certainly sounds like Dan Williams to me. In order to pull the trigger on a player, the team must feel that he gives the team the “greatest margin of improvement,” a phrase that Whisenhunt credits to Graves. Finally, the the GM and Head Coach remarked that final decisions in the draft room are “officially” split 50-50 between them. Graves, however, acknowledged that deference is given to Whisenhunt. Graves commented that “[Whisenhunt is] trying to build a winner out there and keep that sustained. We’ve got to do the things we need to do in order to support that. In order for me to establish any sort of objection, it has to be really out of bounds, and that will never happen.” It sounds, therefore, that Whisenhunt is the first between equals, which makes sense because he’s the one on the field and in the clubhouse. In any event, it apparently obviates conflict. Whisenhunt asserts that there hasn’t been a draft decision conflict since he’s been in Arizona. Whether that’s entirely true is debatable, but it’s hard to argue with the teams recent draft results including Beanie Wells, Dominque Rodgers-Cromartie, Antrel Rolle, Karlos Dansby, Darnell Dockett, Steve Breaston, Anquan Boldin, Early Doucet, and of course Larry Fitzgerald.